Capacity and design: The AKDY WC0012 18 bottle freestanding wine cooler is a great wine cooler for those having limited space and not needing a larger storage capacity. This great smaller wine cooler features 5 metal shelves to keep your wines neatly organized. These shelves slide for maximum convenience and accessibility. The cooler has a single temperature zone. This AKDY cooler uses thermoelectric cooling for nearly silent and vibration free operation (which might disturb delicate wines). This unit is also quite energy efficient and produces minimal heat in the cooling process. The design of the cooler is very clean and stylish. The cabinet and door frame are black with a full glass door to exhibit your wine collection. The tempered glass door has an attractive recessed handle. The cooler’s compact size allows potential placement in a variety of locations. Designed to fit on multiple surfaces, this unit includes 4 adjustable feet. 1 rear fan is used to ensure even cooling within the unit. Single temperature zone and UV protection: This AKDY wine cooler provides a single cooling zone with a temperature range of 50°F – 66°F. From a user convenience point of view, the temperature is easy to read and can be set with easy-to-use advanced touch-sensitive controls. The door is dual pane glass both for insulation and to provide UV protection for your wine collection. Accessible shelving and LED lighting: This AKDY 18 bottle freestanding wine cooler features 5 sculpted chrome shelves that enable easy storage of up to 18 bottles of wine. 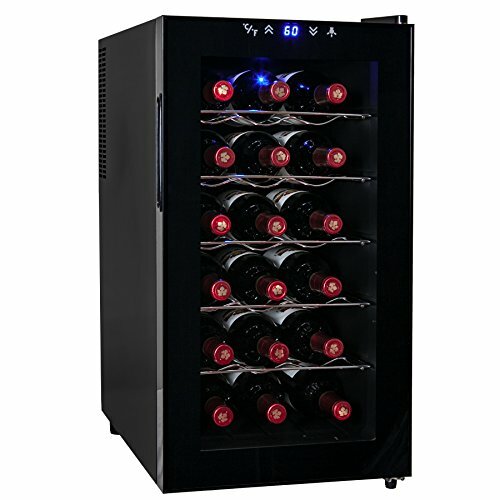 This wine cooler features blue LED lighting to showcase your wines while using minimal energy and adding minimal heat. Summary: The AKDY WC0012 18 bottle Single-zone Thermoelectric wine cooler (View on Amazon) is a high quality, moderately priced smaller wine cooler with great styling. Integrated touch controls are precise and easy to use, with an LED digital temperature display. So long as a 18 bottle capacity is sufficient for your needs, you will appreciate this great wine cooler which can sit almost anywhere in your home. It is vibration-free so that any sediment in your wines will remain undisturbed, and the AKDY 18 bottle wine cooler features near silent operation that comes from a thermoelectric cooling system.